So, uh, what does it all mean? 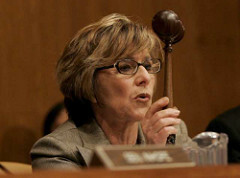 Basically, the climate bill's out of the hands of Barbara Boxer and EPW at this point. The Republican boycott was circumvented. A few of the other committees—like Finance—could now take a whack at it, but it's mainly going to be shepherded by Harry Reid from this point forward. And the "tri-partisan" negotiations between John Kerry, Joe Lieberman, and Lindsey Graham are going to play a key role in delineating the broader outlines of the bill (which will likely mean more offshore drilling, more support for nuclear, and who knows what else). Given that a number of people have been grumbling about Boxer's handling of this bill, and given that James Inhofe and other EPW Republicans were going to absurd lengths to bog down the legislative process (e.g., demanding a five-week EPA analysis that the EPA itself said would be a waste of time), the vote today will likely give the bill some forward momentum, but oy, what a weird week.